Welcome back! Second post for today. My first post on challenge #1 is HERE! 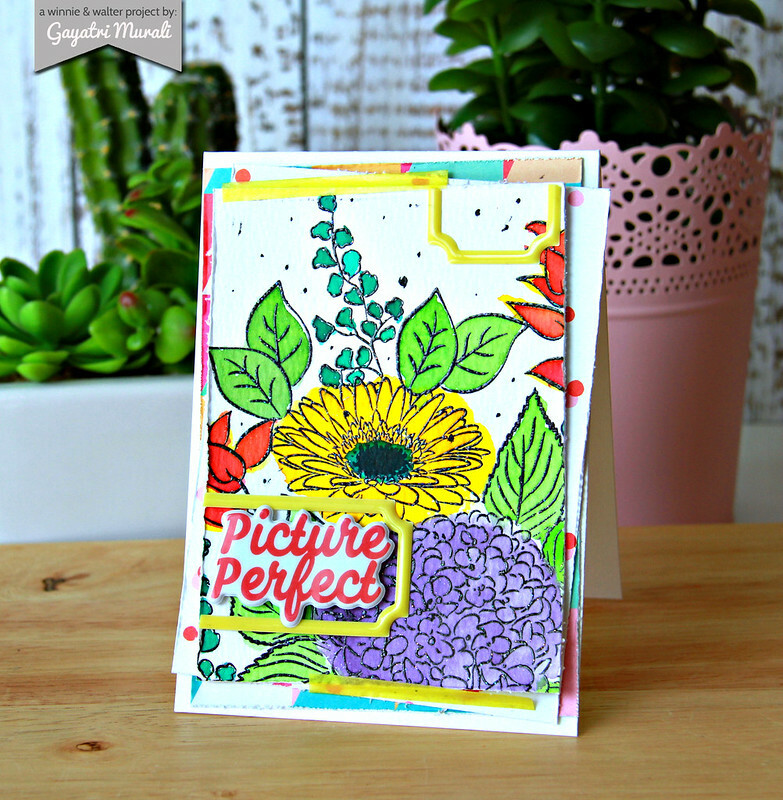 Winnie & Walter is collaborating with Pinkfresh Studio to celebrate (Inter) National Scrapbook Day with lots of fun challenges and prizes. This is the third challenge. Check out Winnie & Walter Blog for more details on the challenges. This is a mood board challenge. Here is the mood board for you. I am inspired by the last three pictures on the bottom left. The layers on the first picture, the geometric pattern on the second and the watercoloured floral background on the third picture. My card combines these three into one on the card. 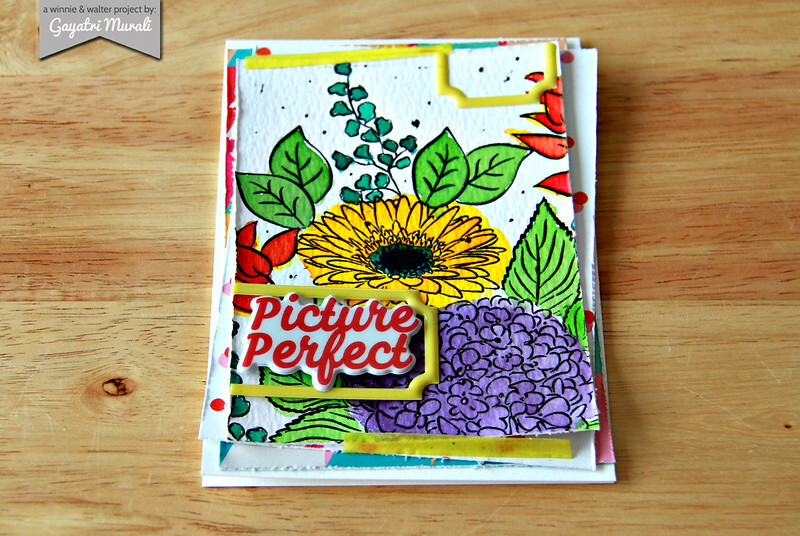 Addie’s Garden stamp set from Winnie & Walter released yesterday is perfect to heat emboss and watercolour. I have used masking technique to stamp and heat emboss the flowers and leaves into a cluster. Then randomly watercoloured the flowers and leaves. Note that the watercolour is not within the lines. I trimmed the panel and layered with geometric pattern paper and the dots pattern paper from the Up in Clouds kit from Pinkfresh Studio. The colours on the flowers and on the pattern papers coordinate. I then used the puffy stickers from the Up in the Clouds kit to add sentiment and dimension to the card. So there are layers, geometric pattern and watercoloured floral all inspired from the mood board on my card. Hope you like it. 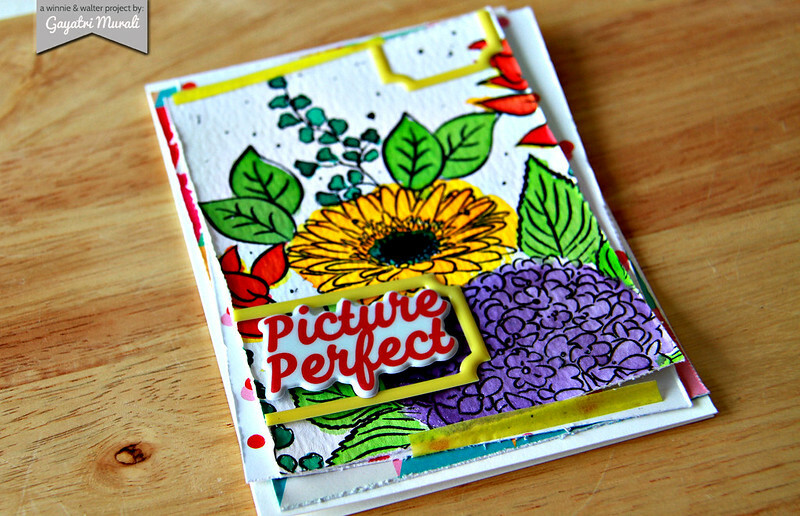 Now head over to Winnie & Walter Blog and Pinkfresh Blog to see more fun challenges and linky to link up your projects. There are so many prizes to be won. I so wish I could color like you girl! Amazing!